I want them to know that it’s not the end of the world if they fall off the balance beam during competition. I want them to occasionally scrape their knees and bruise their shins. I want them to learn how to take risks and be slightly embarrassed when things don’t go to plan. I want my kids to fail sometimes. I want them to build their resilience. I want them to learn how to persist during difficult times. 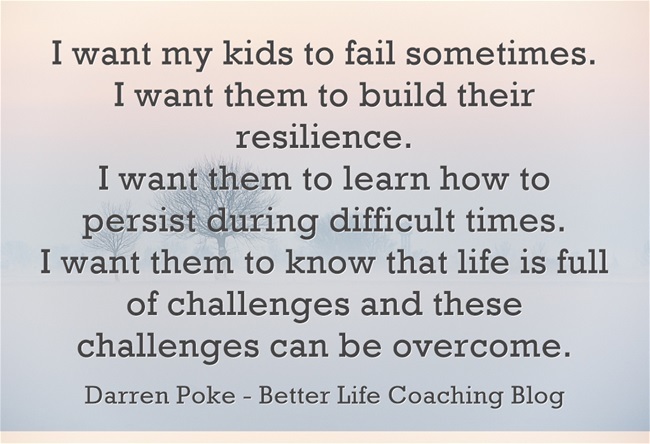 I want them to know that life is full of challenges and these challenges can be overcome. Of course I want my kids to be happy. In my completely unbiased opinion, they are the best kids in the world and I want nothing but the best for them. But the best for our kids isn’t an armchair ride. It’s equipping them with the strength required to make it in the big, wide world when they are older.